Guermond and Minev proposed a directional splitting algorithm to solve the incompressible Stokes equations. Their algorithm applies the alternating direction implicit method to the viscosity term. The pressure update uses a direction splitting method in order to enforce the incompressibility constraint, as opposed to commonly used projection methods that require the solution of a Poisson equation. The significant part of the algorithm is that all of its implicit equations can be transformed into many independent tridiagonal systems; therefore, each step of the overall algorithm can be solved in O(n) time, where there are n unknowns. 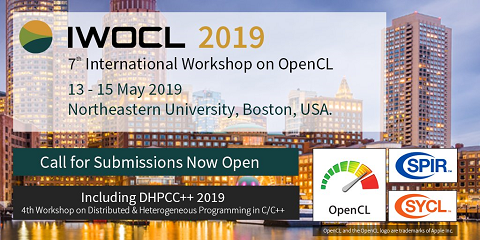 The goal of this course project is to develop a massively parallel GPU fluid solver for the incompressible Navier-Stokes equations using OpenCL and the directional splitting algorithm. GPUs are well suited to massively parallel numerical problems because they have hundreds of small cores specialized for numerical computation. Therefore, GPUs are applicable to solving many tridiagonal systems simultaneously. The non-linear term of the momentum equation is solved using an explicit, semi-Lagrangian method. Numerical tests verify solutions to the Navier-Stokes equation and show that simulations run in linear time with respect to the number of discretized points in the domain. An OpenGL renderer was developed to visualize simulations in two dimensions.